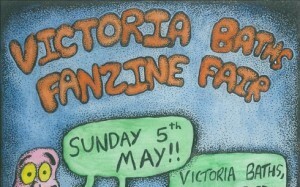 Enjoy the bank holiday in do-it-yourself style with this year’s Fanzine Fair at Victoria Baths. For its third year the fair brings together fanzine makers, indie publishers, designers, arts and crafts makers and small record labels to celebrate self-made counter-culture from photocopied Punk fanzines of the 1970s to blogs and online art today. Held on Sunday afternoon, the fair will be accompanied by a special screening of Helpyourself Manchester, a film depicting “the unsung story of Manchester’s DIY music promoters”. The screening will be followed with a special Q & A with the film’s directors from the Castles Built in Sand collective. A choir performance in the Gala pool by Ordsall Acapella Singers will soundtrack the event, and visitors have the chance to help produce the Bath’s own fanzine The Vicky. In a statement, organisers said the fanzine “will use team effort, collage, lino printing and on-the-spot reportage from the fair to compile some articles about why public wash baths should be making a comeback! Artist John Mather will be on hand to talk through his pictorial guide to the city’s swimming pools, the potential closure of which has been the subject of local protest and controversy, and author David Hartly will read from his new book Threshold. Karen Ablaze! will also be present to talk through her experiences of making zines in Manchester and Leeds in the 1980s. A guided musical tour inspired by the history of the restored Baths will be given by Manchester-based illustrator David Carvin, who will take visitors through songs retelling the stories of the ladies pool, channel swimmer Sunny Lowry and the building’s grand Victorian stained glass windows. Guided tours of the Baths will also be on offer – including a “behind the scenes” tour of the magnificent partially restored Ardwick building.